Councilmember Marilyn Ashcraft is siding with large corporations. 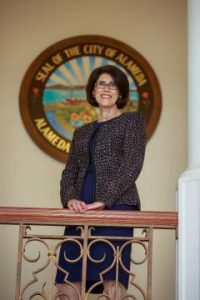 Alameda Councilmember Marilyn Ashcraft, a self-proclaimed “progressive,” has taken the side of large corporations on a local tax measure. Measure B1, an Alameda Unified School District parcel tax renewal, is an otherwise laudable tax measure, if not for the annual cap of $7,999 that benefits the largest property and building owners in Alameda. Under the tax, average homeowners pay 32 cents per building-square-foot, based on the size of their home. However, a large corporation with a large building – and there are several in Alameda, just look to South Shore Shopping Center and the Harbor Bay Business park – is protected by the tax cap. A large corporation with a 25,000 sq foot building would pay 32 cents per square foot, just like the homeowner. But a corporation with a 50,000 sq foot building would pay just 16 cents, or half of what the average homeowner pays. A corporation with a 75,000 sq foot building would pay just 11 cents, and for a 100,000 sq foot building, they’d pay just 8 cents per building square foot. The corporate owner of a very large building could pay as little as just a penny per square foot, while average homeowners pay 32 times as much. That corporation owning the 100,000 sq foot building is saving $24,000 per year – money that the school district, and Marilyn Ashcraft – are leaving on the table, shortchanging our students. Marilyn Ashcraft has taken the side of large corporations by endorsing Measure B1, and shortchanging Alameda students. This entry was posted in Alameda and tagged Marilyn Ashcraft, Measure B1 2016 by SOCA. Bookmark the permalink.